Spend your quality honeymoon moment at the wonderful places of Pokhara, Nepal. Cherish your mate by offering a supernatural experience of boating at Fewa Lake. Meantime admire your eyes with the live shadow of miracle snow-capped lofty Annapurna Mountains sparkling on the lake. Delight yourself with the breathtaking sunrise views over the giant white peaks from the top of the hill station and observe the birds-eye view of the entire Pokhara City. Feel the adventure by entering into the naturally formed caves and take the blessed with the god found inside. Yes, all these attraction at one place, Pokhara. 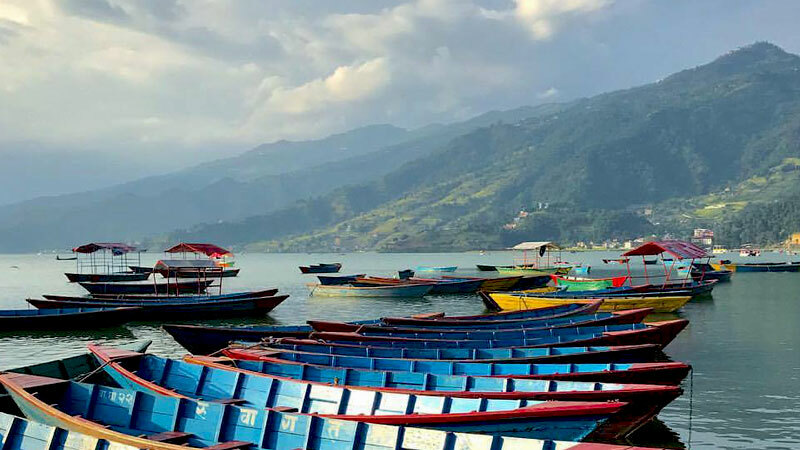 Our Pokhara Nepal Honeymoon Tour Package begins with seven hours of scenic drive from Kathmandu to Pokhara. The route follows the Prithvi Highway offering the views of many awesome small villages and rivers like Trisuli River, Marshyandi River, and Seti River. Trisuli River is famous for the day white water rafting among the adventurous lovers. You can too participate and gain the rafting experience of Nepal. Not only that but also another popular temple among Nepalese cultural, Manakamana Temple is yet another attraction of the route. The temple is situated in the hill station and Nepal's first cable car operator Manakamana Cable Car organization is carrying visitors to the top of the hill. It is believed that the goddess has the power of fulfilling wishes of her devotees. On the second day morning of the tour, drive to Sarangkot to view the sunrise over the Annapurna Massif. Enjoy the breakfast and visit other attraction of the city like Temples, Caves, Lakes, and Water Falls. Then back to Kathmandu valley and explore the UNESCO World Heritage SItes. Begins the morning with hot breakfast. Prepare to commence the incredible honeymoon trip. Drive Kathmandu to Pokhara. Pokhara is 206 km far from Kathmandu and takes around 7 hours. Arrival at Pokhara and hotel check-in. Free time and overnight at Pokhara. Day 03: Pokhara Sightseeing Tour. Twin Bed sharing (2-5 star) hotel accommodation at Kathmandu and Pokhara. Expenses occurred due to landslide, strike, political unrest etc. Wants some modification on Pokhara Nepal Honeymoon itinerary? contact us to customize it.